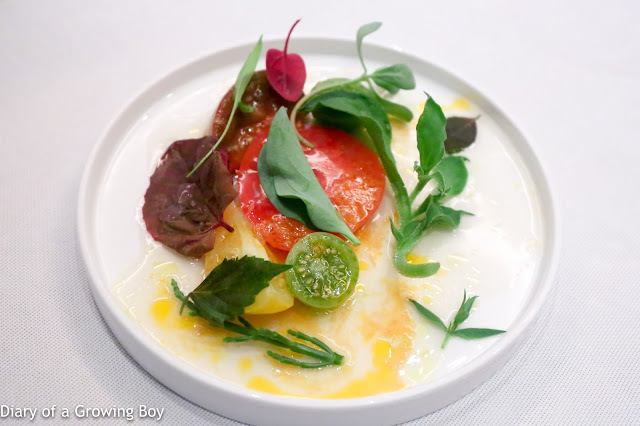 I had seen series of pictures and videos taken by The Great One and Chef Richard Ekkebus from their trip, so I wasn't too surprised when I got the announcement that Dan Hunter would be doing a series of four-hands meals with Richard at Amber. As is my practice, I put my hand up for a table at #AmberHKxBrae within minutes of seeing the announcement, then proceeded to syndicate out the extra seats at my table. I gotta say, though... it was noticeably more difficult this time around compared to previous 4-hands or pop-ups. 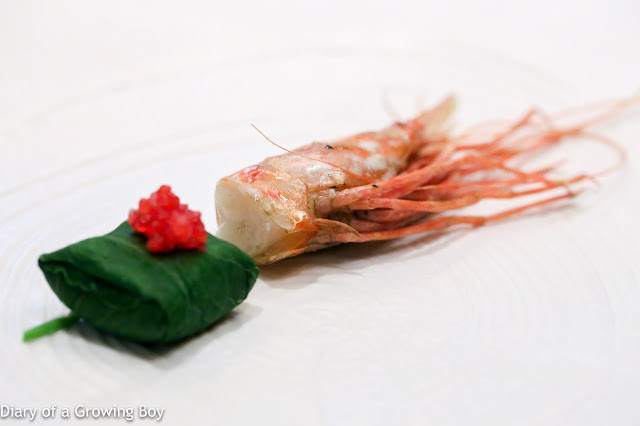 Prawn, nasturtium, finger lime - prawn 'two ways'. The tail of the prawn has been diced by left raw, then mixed with a paste of lemon juice, tomato juice, and tarragon (or was it tamarind, as the stated in the Brae recipe book?). 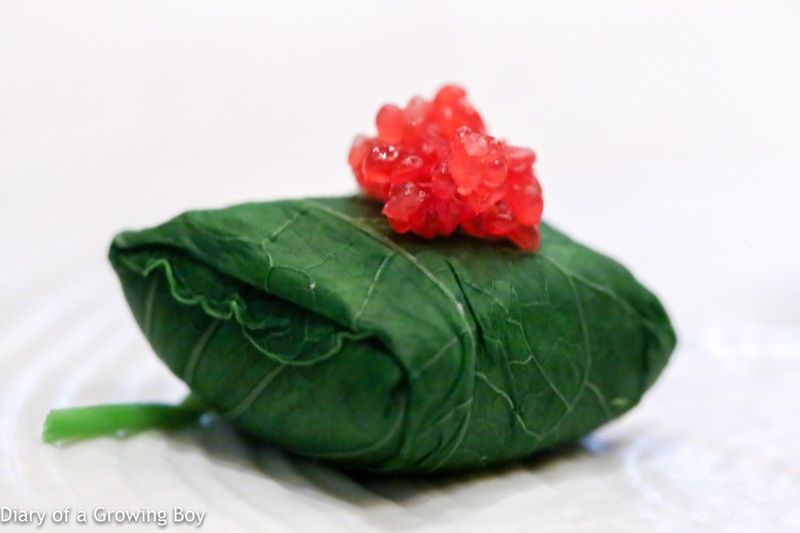 The mixture was wrapped inside a blanched nasturtium leaf, and topped with finger lime caviar. As there were no serving utensils for me to cut the package in half, I put the whole thing into my mouth. Biting down delivered a very springy sensation, with the contents seemingly wanting to push back against the force exerted by my teeth. 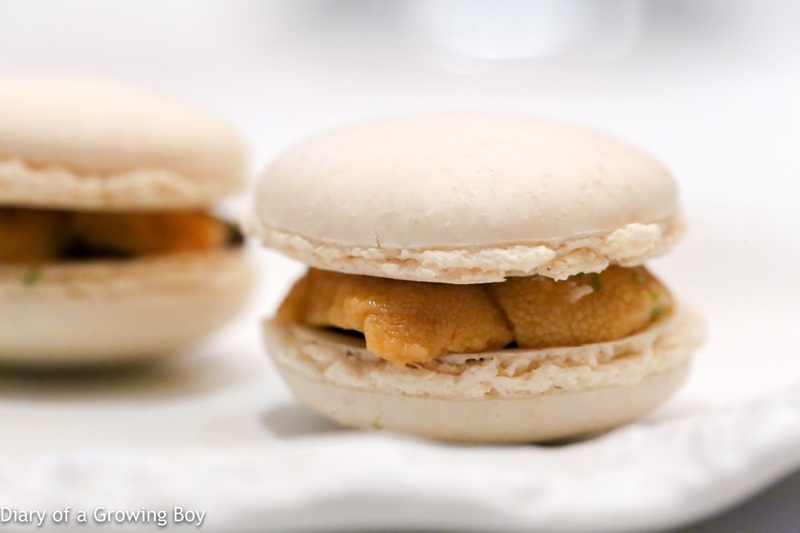 The acidity from the finger lime was immediately apparent - and rather overpowering. 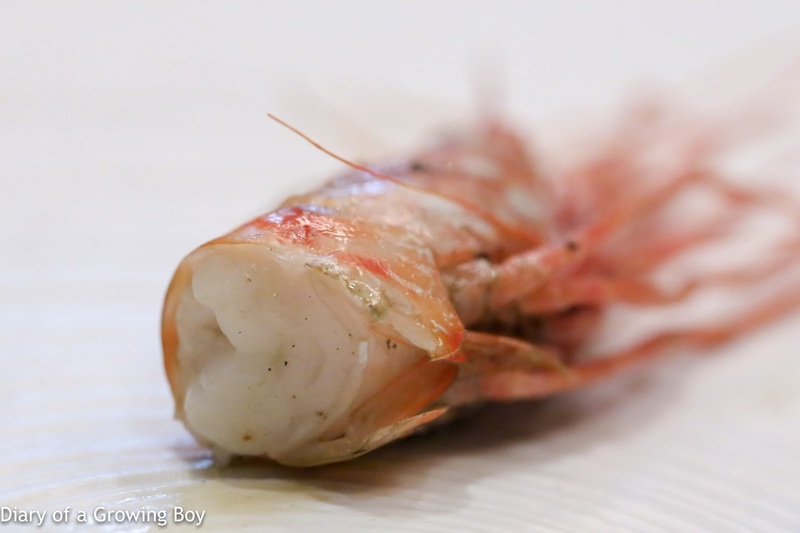 The head of the prawn was grilled with apple cider and olive oil. The juices inside the head tasted wonderful, but unlike my Malaysian neighbor, I did not eat the whole head. 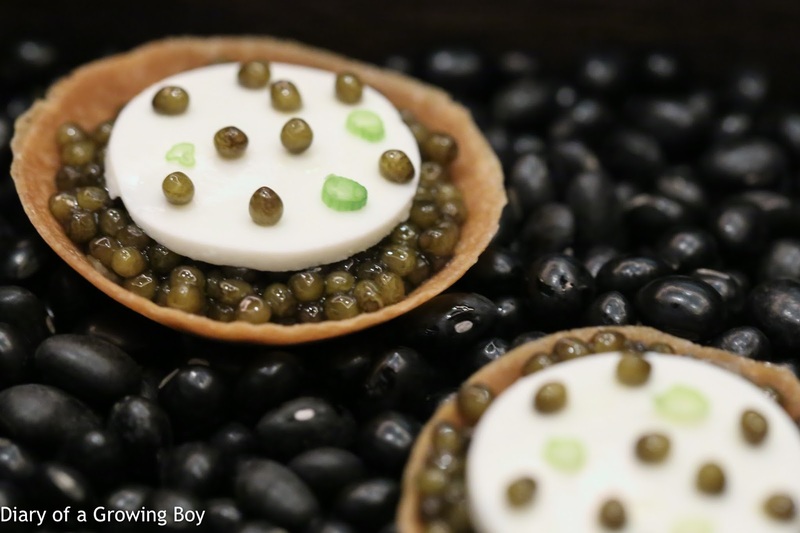 Caviar, leek and crème fraiche tart - we were told that the caviar from Schrenki sturgeon farmed in Heilongjiang (黑龍江) China would taste like sea urchin, but it tasted pretty much like how I expected sturgeon caviar to taste - which was to say salty, fishy, and oily... and opposite of the sweet and creamy flavors from sea urchin. 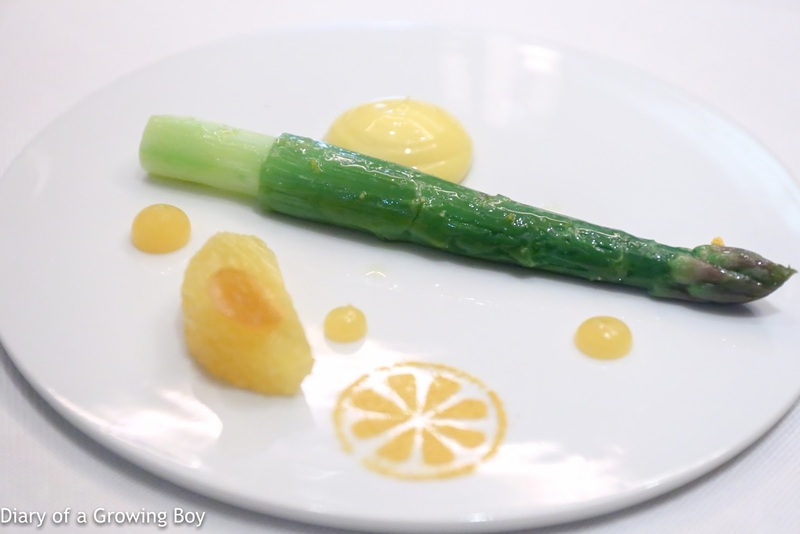 The layer of crème fraîche on top was a perfect complement to the caviar, along with finely diced leeks. The pastry shell, though, was a beautiful surprise... delivering amazing fragrance once the tart was inside the mouth. Foie gras, Campari and 100% bitter chocolate - yes, foie gras goes well with chocolate, although personally I would have preferred a lighter chocolate for a sweeter sensation. 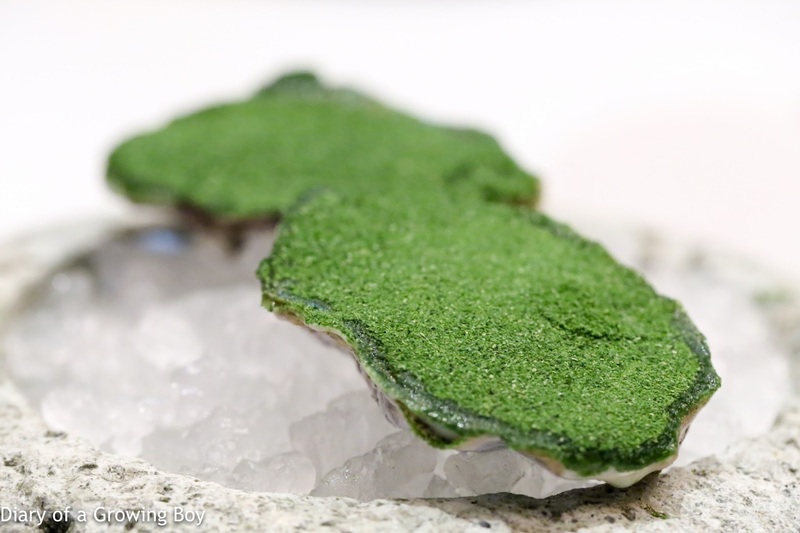 Iced oyster, by Brae - the lovely fragrance of sea lettuce greeted me immediately after this arrived, and I love the umami from this type of seaweed. 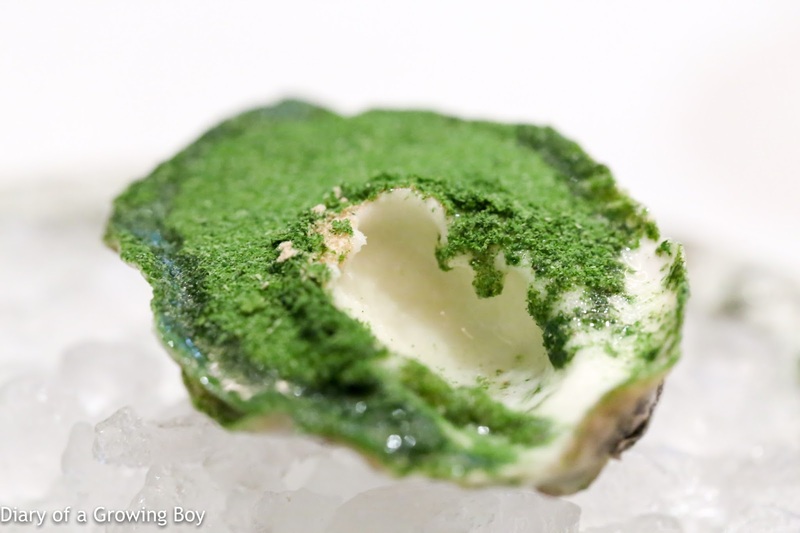 There was actually no oyster to be found underneath the top layer of dehydrated sea lettuce powder. Instead the oyster shell was filled with ice cream made in a Pacojet. While the ingredients for the ice cream was supposed to have included oyster water and dehydrated oyster powder, all I could taste besides the sea lettuce was milk and sugar... along with some acidity. 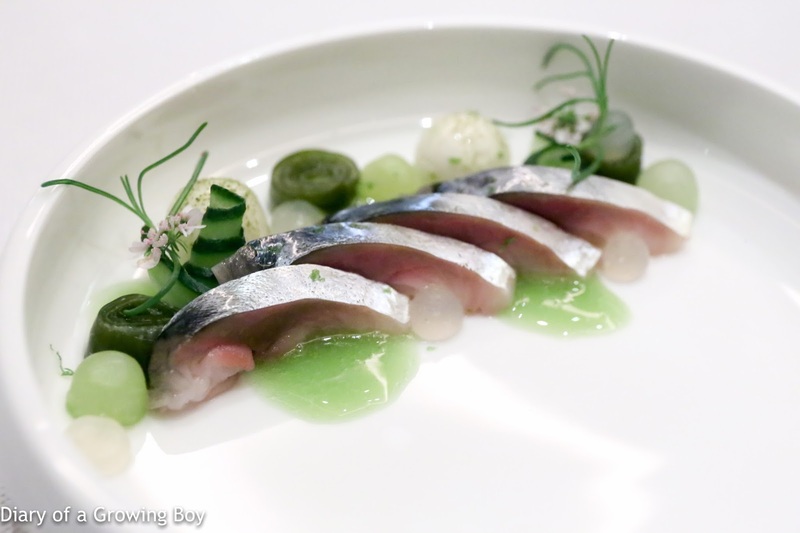 Saba mackerel "kombu-jime", kyuri cucumber and sake leese, by Amber - the mackerel has been cured by wrapping kelp around it in the classic Japanese process of kobujime (昆布締め), which imparts very subtle flavors. The fish came with rolls of kelp (昆布) and cucumber, as well as cucumber coulis, cucumber balls, sake lees (酒粕) balls, and gel made with bonito dashi (鰹出汁). A couple of edible flowers left some amazing fragrances in the mouth. A very refreshing dish perfect for the summer. Tomatoes and uncommon leaves in sea water, by Brae - delicious raw and confit tomatoes - no doubt from Brae's gardens - along with ice plant, salicornia, perilla leaves, and other "uncommon leaves". Drizzled with sauce made with with "mussel water" and olive oil. Absolutely delicious, showcasing the purity of flavors from ingredients. XL Pertuis green asparagus, Sicilian pistachio and amanatsu, by Amber - I wasn't surprised that Richard would choose to match Brae's tomatoes with a giant spear of green asparagus from Provence. 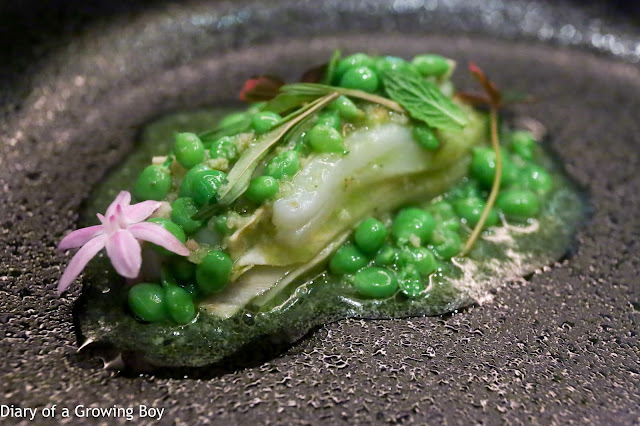 The asparagus was blanched in pistachio oil and came with a dollop of Maltaise sauce on the side - no doubt made with the Japanese amanatsu (川野夏橙) which was also presented on the plate. The little slice of orange peel was particularly nice and fragrant. Calamari and fermented celeriac, barbecued peas and beef fat, by Brae - this was probably the most interesting dish of the evening for me. Both Hello Kitty and I detected fermented flavors when the plates were laid down in front of us, and indeed there were thin strips of fermented celeriac in between layers of calamari jardiniere. I loved the flavors of the calamari, plus of course the sweet green peas which had been barbecued. You've got beef fat mixed in there, which made it all the more sinful and delicious - along with herbs like mint leaves and other incredibly fragrant flowers. 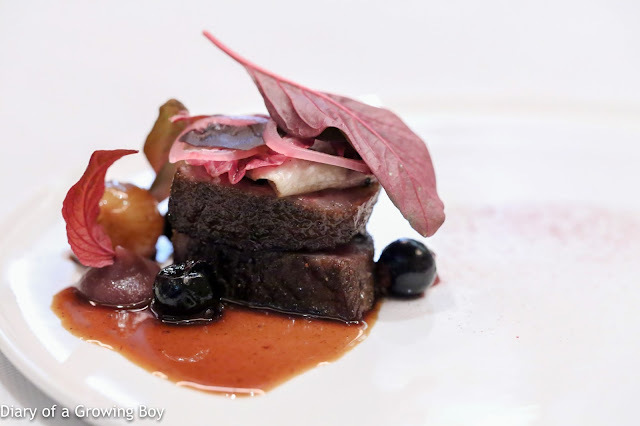 Hakoo Farm Miyazaki wagyu beef striploin, red onion, dulsey, cassis and Shiraz, by Amber - again, not surprised that Richard has chosen A5 Miyazaki beef to finish. 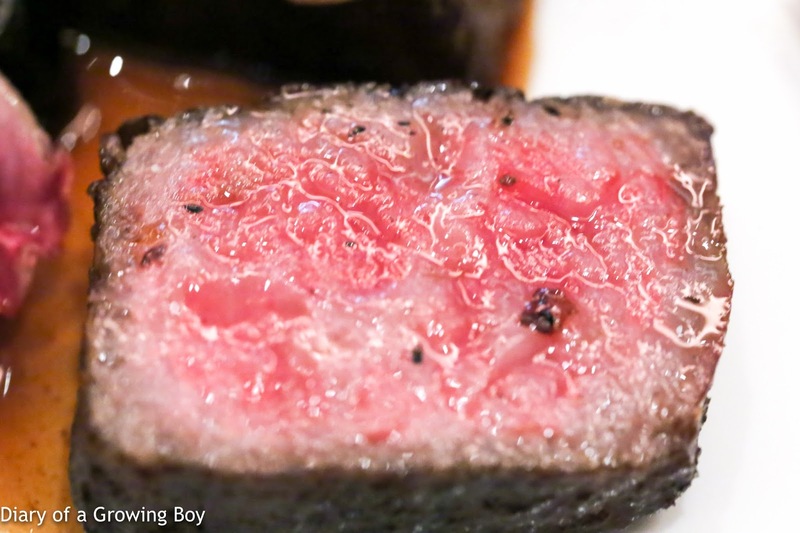 The beef, of course, was cooked perfectly... with all that marbling to make it tender and succulent. This came with "ratassio" radicchio, red onions, pearl onion, blackcurrants, and a Shiraz sauce. While I liked most of what came on my plate, I felt the blackcurrants delivered way too much acidity for my taste. Parsnip and apple, by Brae - interesting that parsnip would be made into a dessert. 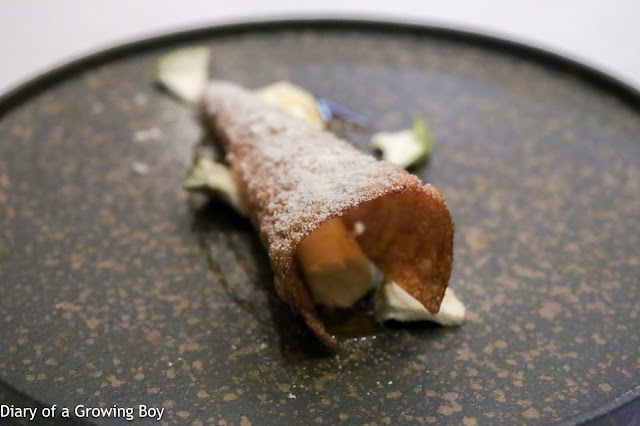 What looked like a conical pastry shell was actually the parsnip skin that has been baked and then fried. Within the shell was a tube of mousse made with apple and parsnip. Served with an infusion with camomile, honey, caramel, along with dehydrated Granny Smith apples. Finally sprinkled with shavings of freeze-dried apple in place of caster sugar. Pretty delicious. Hokkaido corn and Western Australian winter truffle, by Amber - corn as dessert is definitely an acquired taste, and one which I have acquired during childhood growing up in Singapore. At the bottom of the bowl was corn custard, with cornbread encased in the middle, topped with a quenelle of corn ice cream along with some popcorn on the side. 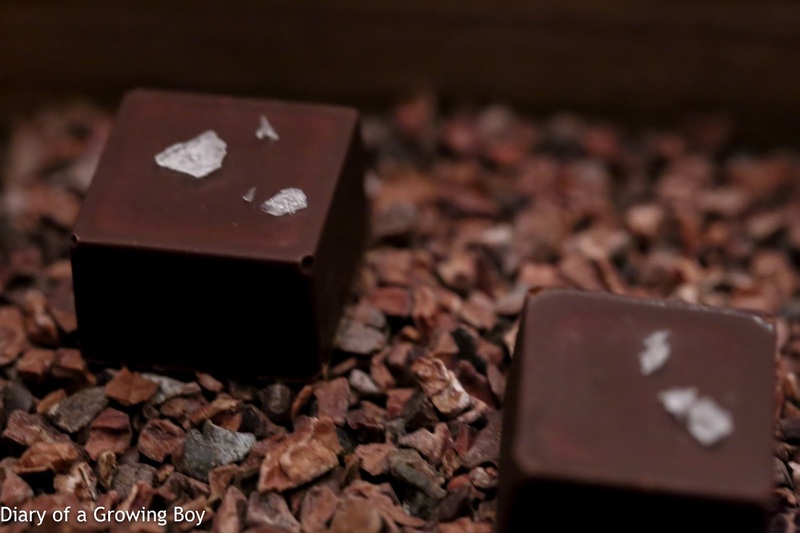 The fragrance that hit our noses, of course, was coming from the chiffonade of Australian winter truffle. This was not bad. The feuilletine on the side was topped with corn and truffle sauce. 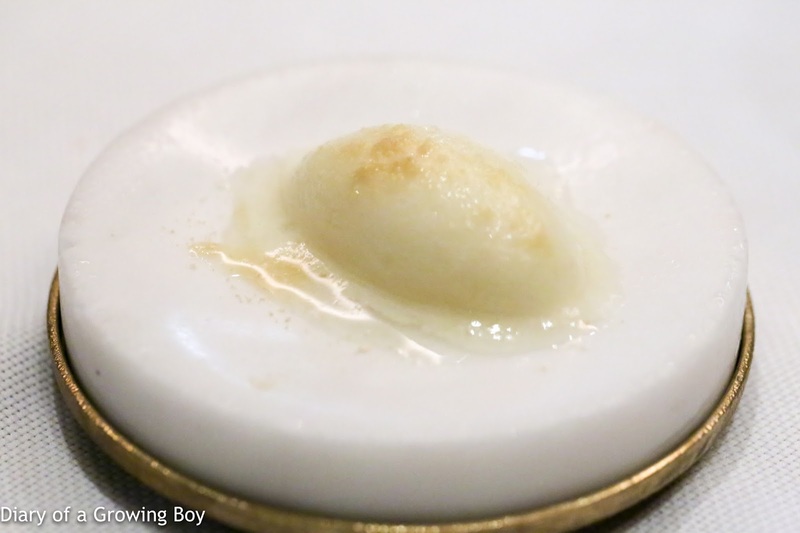 Pineapple sorbet - with lemongrass and ginger powder making it a little spicy. 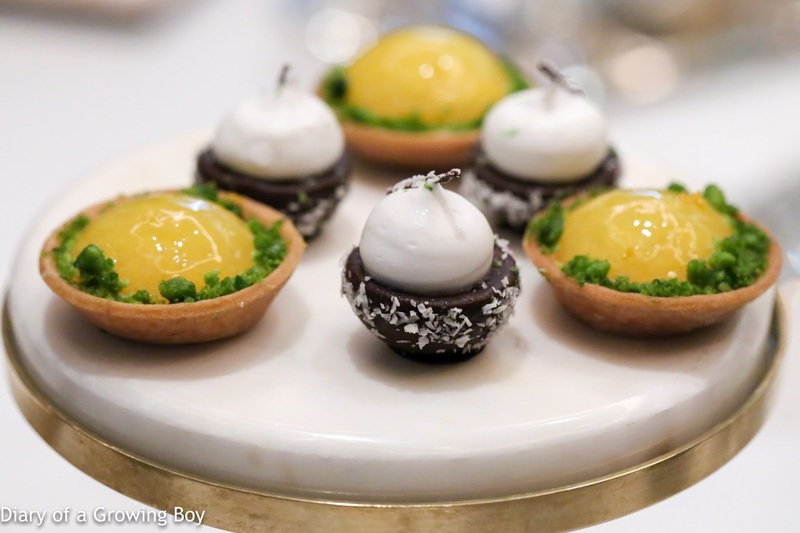 Orange and pistaschio tart, chocolate with coconut cream. 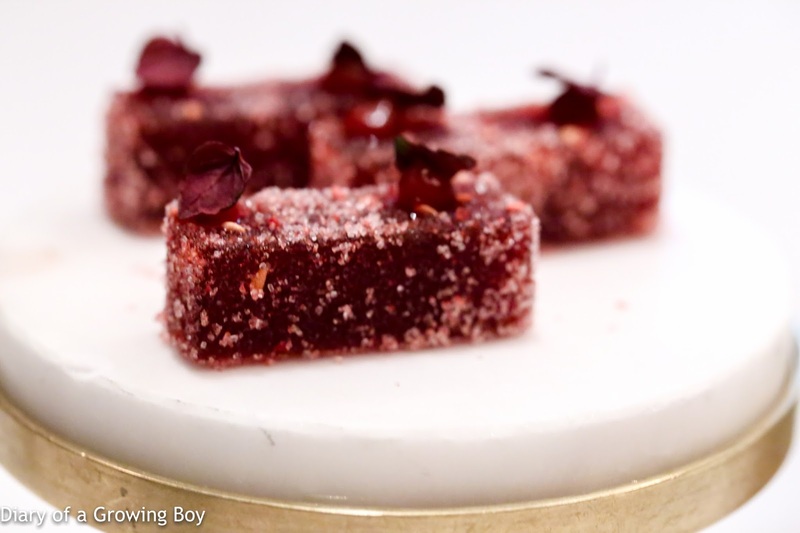 Framboise pâté de fruit - with red bell pepper gel and red perilla leaves (?) on top. Very delish and clearly the crowd favorite. I would have been more than happy not to drink wine tonight, but as usual My Alcoholic Favorite Cousin supposedly had a rough day at work and needed alcohol. So Baller and I combed through the wine list in search for wines which we felt were ready to drink and had the most reasonable markup. We did try to look for a bottle of Aussie red to tip our hats to Brae, but failed miserable to choose one fitting our criteria... We eventually ended up with a bottle of bubbly and a red. 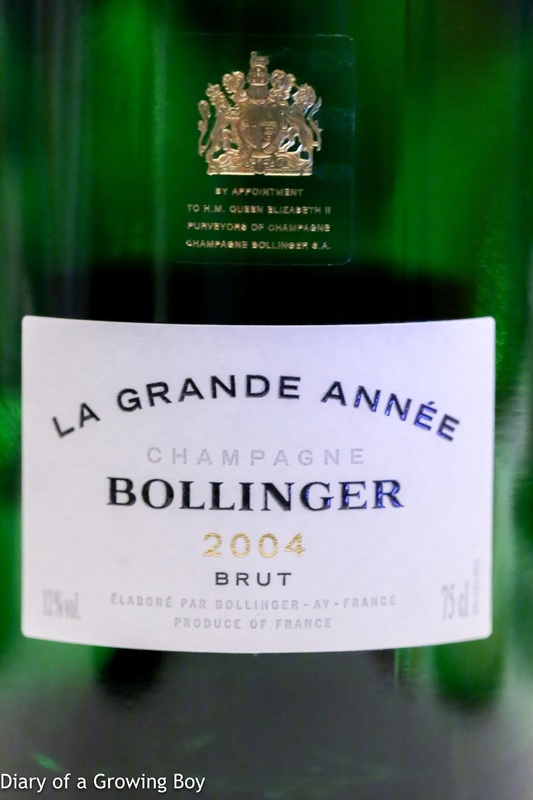 2004 Bollinger Grande Année, dégorgée en Septembre 2012 - nice and caramelized nose, with salty plum. 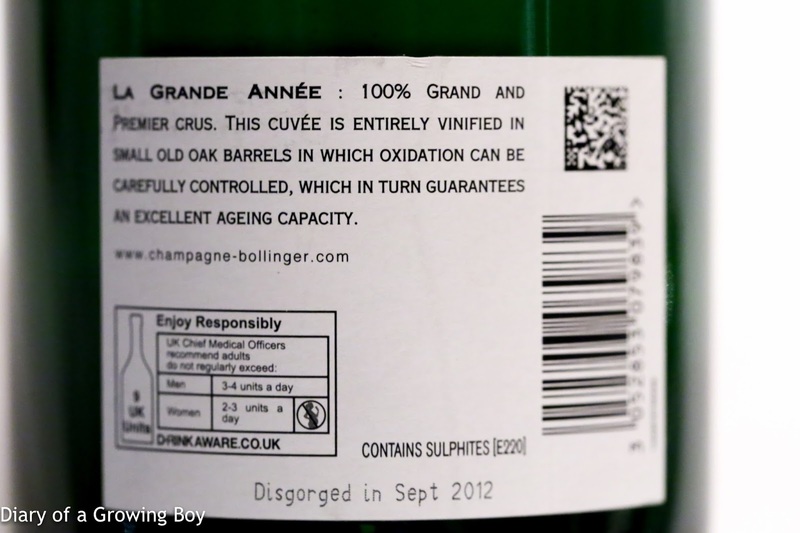 Acidity was rather high at first, but became smoother with some prawn juice in the mouth. Nice toasty notes with sweetness from vanilla. Drinking nicely now. 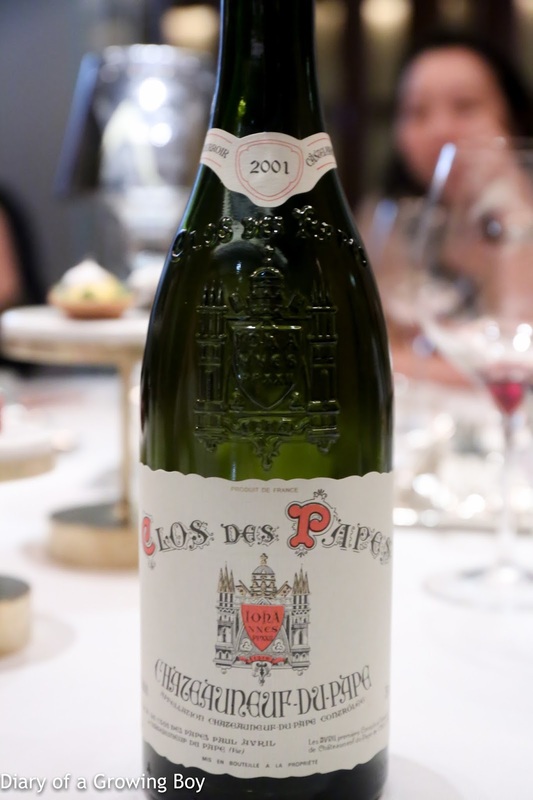 2001 Clos des Papes - decanted for 1½ hours at room temperature, so it was served a little warm for my taste. A little less stinky after aeration in decanter, but the alcohol was still a little sharp. Good sweet fruit, with cedar and almost a little coffee notes, along with smoked meats. Good acidity on the palate. Not drinking as well as hoped. This was an interesting introduction to the dishes from Dan Hunter, and I think one would only get fully immersed in the experience while dining on location. One disappointment tonight, though, was that I didn't get to have any roo for dinner. 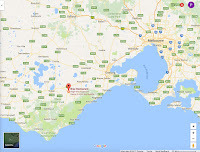 Given the number of recipes on wallabies and kangaroos in Dan's book, I'm sure it will be on the menu when I visit.